If you have questions about techniques or just curiosity about the how to of art, drop me a line by way of a comment. Might make good material for a post, because if you have a question, there’s bound to be others who are wondering the same things! The abstraction of the small parts of the picture should match the abstraction of the whole if the picture is to make sense. Once you decide it’s going to be orange, there’s just no turning back. Complementary colors are ones that appear especially intense because they contain opposite frequencies of light. Blue and orange, red and green, yellow and violet are all color opposites. 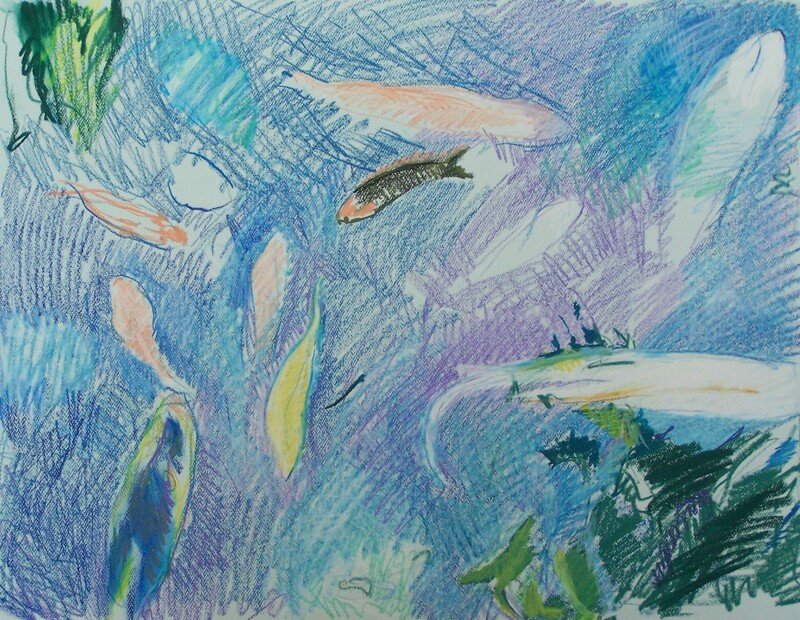 One subject that I portray often in my art — the koi pond — has a natural blue/orange opposition since many of the fish are orange and the water, reflecting the sky, is blue. But the sea shells I collect have strong passages of orange too and placed against a blue cloth they stand out very boldly. 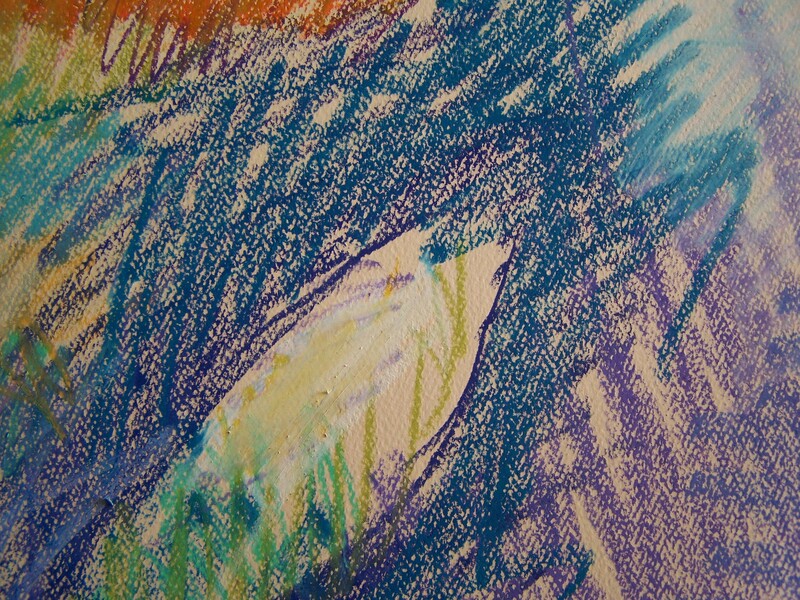 Exploration of color is one of the principle motives of my artwork. So I try to understand color, making a particular effort to explore different colors and different color combinations. Toward that end I collect objects from different color groups. The orange vase that sits nestled among the objects on my still life table is one such example. I have also learned about the color orange by looking at how other artists use it, as in this copy of Bonnard’s orange jug that I made in front of his still life using oil pastel. In Bonnard’s picture you find orange and blue together: the orange of the jug and blue from its shadow cast by the sunlight coming through a window. Something doesn’t have to be exactly orange to create the dynamic of blue/orange opposition. Something that is almost orange will do it too. There’s enough red and yellow in the blue compotier against the jade green cloth to create a lot of blue/orange signal in the light. The warm/cool contrasts and the general bouncing around of red and yellow light against bluish color does something similar. The subjects can be very dissimilar but orange has a mood it brings along, and objects that are orange colored pull that sensibility from our minds. I feel like these things are connected simply because they are the same color, whether they are fish or vases or fruits or something else. They all participate in the essence of orangeness. One ought to study all the colors to learn their meanings. By the time I started work on the darker colors I was listening to Janos Starker on the “boom box.” It’s hard not to make rather vigorous stokes when Janos Starker bows such vigorous strokes. My orange fish got so orange that I forgot all about his lovely tail. It becomes reduced to just a slender cylinder. Meanwhile, the dark fish seems to leap even more swiftly in this version. All the fish were swimming to Kodály by this time. Today was drawing day. 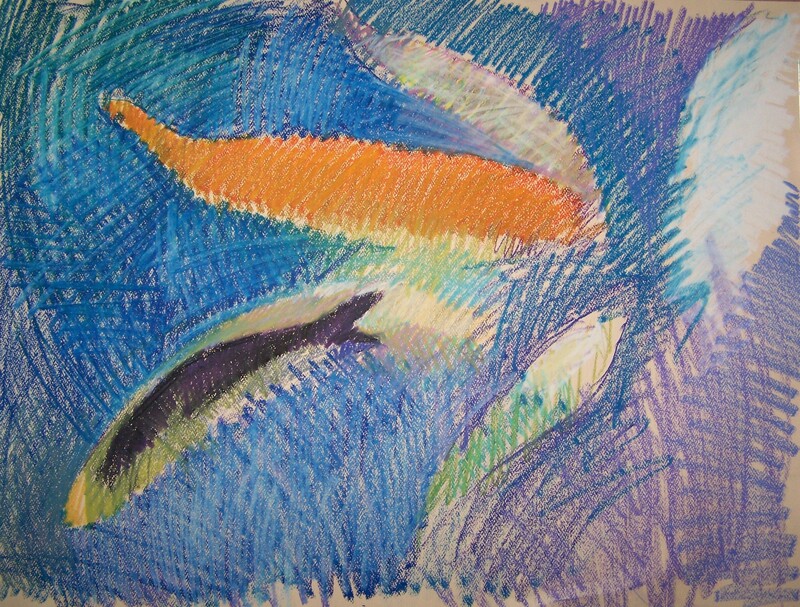 I made three studies for the koi paintings. The freedom of drawing is exhilerating. Beginning an idea from the blank page always delights me, but I am supposed to be finishing paintings. Well, this way I get to eat my cake and have it too. I am “working on” the painting — indirectly. I am trying out ideas, rehearsing my lines, all of which gives me necessary practice for the painting. But I still get to begin from blank. The version above is a compositional sketch for the whole painting. In the next couple posts I make studies of the group around the dark fish. I paint my koi from photographs. It would be an interesting experiment to do them entirely from life. Many years ago I painted from life almost exclusively, and back when I decided that I would be an artist, when I was trying to learn what I thought of as being the foundation of art, I worked from life. I’m glad I did. The habits I gained have worn well. But later on, I found that certain subjects did not fit into an approach devant le motif. Indeed, it became a kind of lesson in art history too — to become more aware of all the various kinds of artifice employed to create seeming “life likenesses” over the centuries. 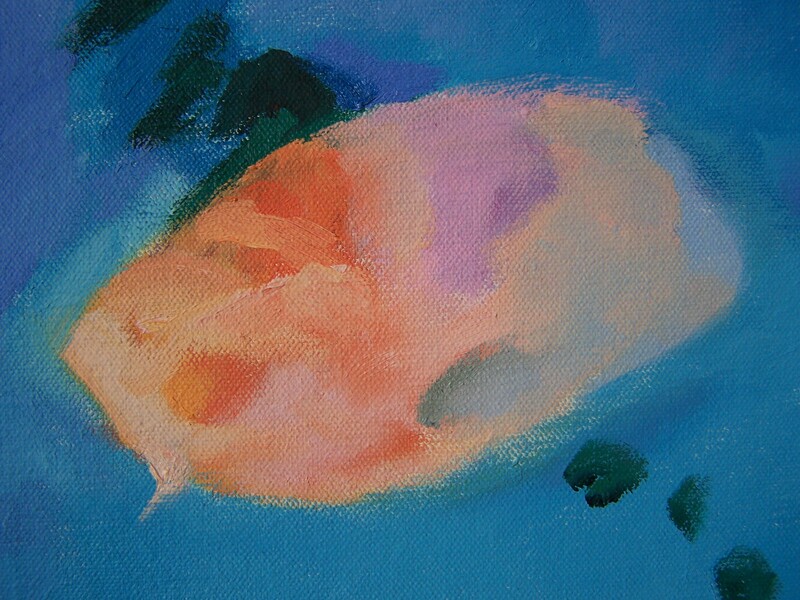 The koi was something I wanted to do to explore abstraction in the wake of my renewed love for the work of Californian Richard Diebenkorn (one of my favorite 20th artists). I found something that was very perceptual and which had a lot of distortion built into it, but which was of course as “real” as one might ever desire. Yet I soon realized that I needed the photograph for practical reasons (the koi pond was not convenient to my home). But I also soon found that the photograph interprets the image so thoroughly that many of the effects I found most interesting could be achieved by no other means. The camera stops time. 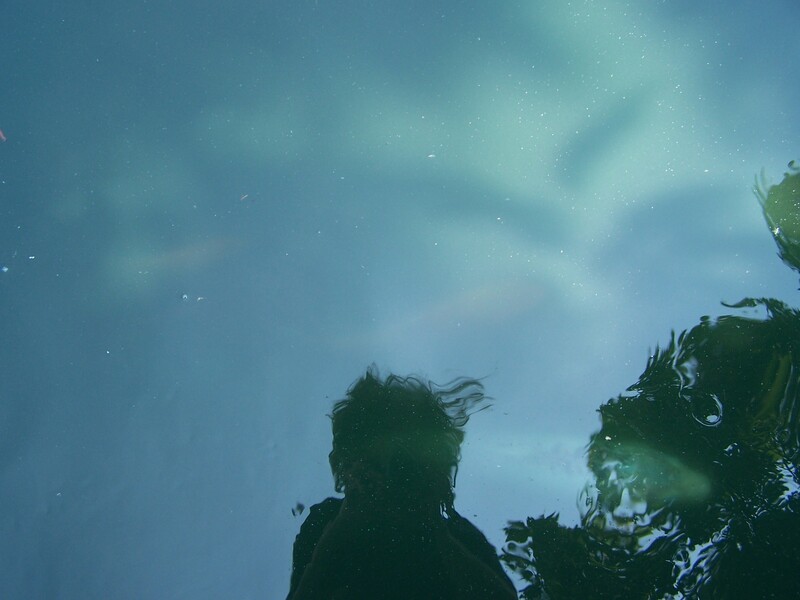 In some of my photographs (I had no idea what I was doing, by the way), the water was frozen. Planes of the water’s structure were caught and carved out of their constant fluidity. The amazing shape of the water as it moves was there to draw — something that I cannot see with the naked eye. Then the fish, also, were alterred in interesting ways. In some photos the fish are stretched out as they swim through the exposure, the exaggeration of their shapes simulating something of their movement. Happily I found that the photograph was amenable to interpretation as readily as the real place. I began by drawing the photos very faithfully (I thought), but my own habits of vision interpolated something that wasn’t strictly there. One introduces “distortions” that arise from longing and attention. So I was in effect synthesizing the experience in ways parallel to what I would do when drawing from life. Only the photograph opens up a world not visible to ordinary sight. There are so many ways of painting a thing. That’s what the real abstraction of art is about. As you are drawing, as you are noticing your subject, your attention takes you to qualities that someone else might not notice — or might not notice with the same emotion that you feel. As your gaze ranges over the image, caught in the attraction of what matters to you, you are reinterpreting the life that you see. Your being held captive in the subject gives it meaning — it reveals the meaning it holds for you. 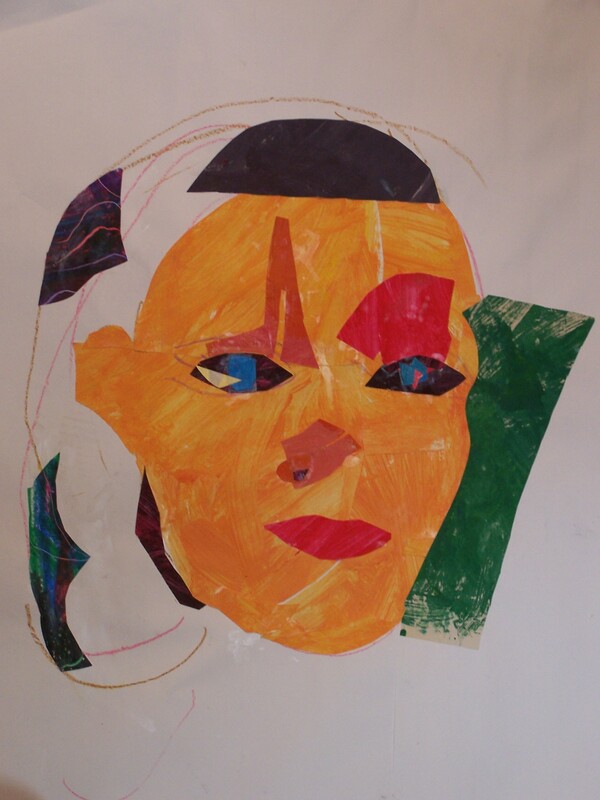 The choice of subjects, the choice of how to see the subject, these are very personal things. Many artists paint the same subjects, and sometimes a convention takes hold and the paintings will be similar. This isn’t necessarily bad. Conventions, traditions, can be very rich. They can be ennobling. Sometimes they enlarge ideas. Many great artists chose to work in styles that were broader than their personal territory. The great English landscape painter Turner made many landscapes in imitation of earlier masters like Claude Lorraine. However, the reverse is also true: sometimes imitation of a style can become too conventional — so much that it conceals rather than reveals feeling and life. But to let yourself be simply alive before the subject, to let your thoughts range where they will, to allow the subject itself (such as the swift koi) determine what the meaning will be — this is a wonderful way of losing oneself — and of finding oneself — in art. Then painting is like music. And it just goes over us and through us and carries us along with it. These first blocked-in forms are a simple melody that I hum to myself: the music’s first notes. Can you see his whisker? So far, this fish face has just a whisper of a whisker. But it’s there! 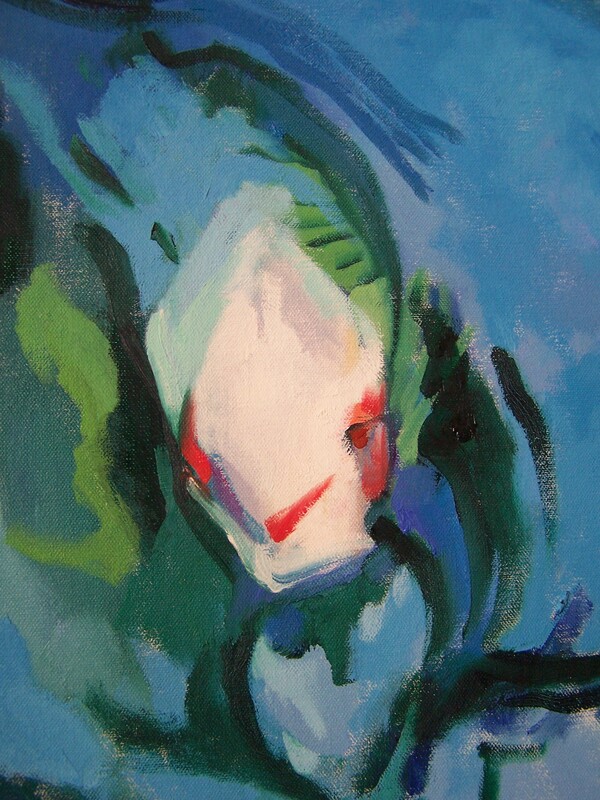 I remembered what it was that I loved about painting the koi — the abstractness. Everybody paints these things differently. Other koi painters love detail. But I had looked to the koi as a subject in my first koi painting because I wanted something that was abstract yet represented something. I like to paint stuff. And koi are great stuff! And the faces. 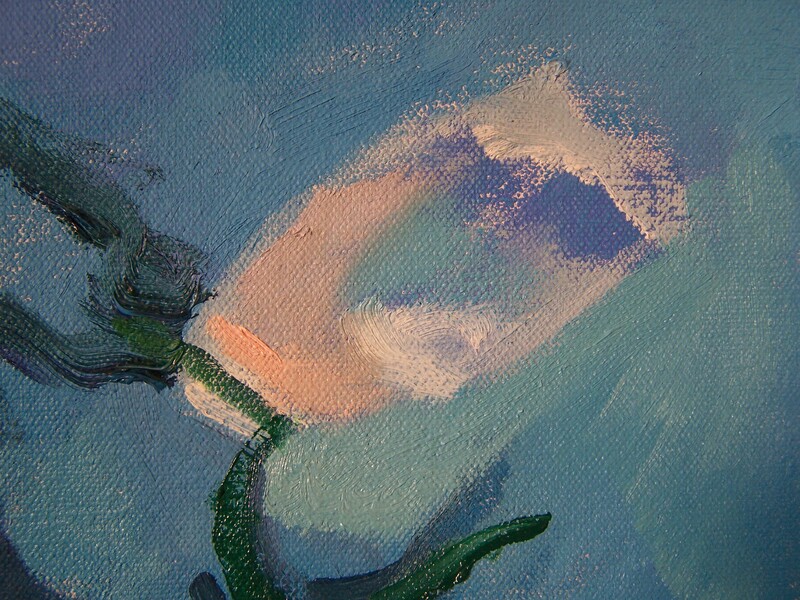 I find the abstractness in the small parts of the painting. Maybe when they are finished, I’ll have represented them whiskers and all… who knows? But this playing around with planes of color — and all the delicious difference of a color that is a nuance warmer or yellower or something-or-other-er than its surroundings — all that play of paint just delights me like a kid with a crayon box. This, friends, is why I became a painter! There aren’t enough hours in the day! 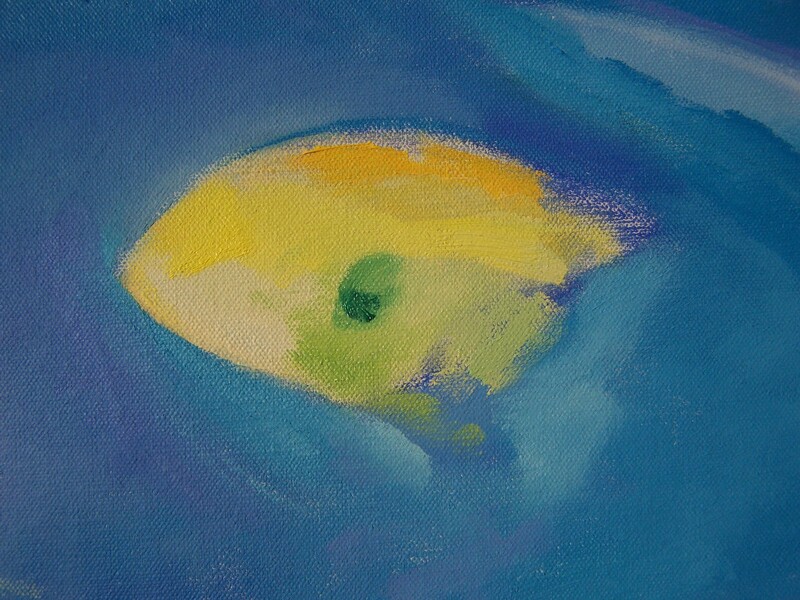 I am beginning to paint the fishes up close. And the paintedness of the picture is my daily delight. The image is settled, yet everything is up for grabs! For the way of painting this “everything” is wide open. And this is the part of painting that I love. The gesture, the stroke, the decision, the changing my mind, and the joyful making of marks!